Philippine President Rodrigo Duterte delivers a speech during the Philippines-China Trade and Investment Forum at the Great Hall of the People in Beijing, Oct. 20, 2016. "In this venue, your honors, I announce my separation from the United States, both in military, not maybe social, but economics also,” he said, speaking at a business forum late Thursday. His remarks to the crowd of business people and officials triggered a roaring round of applause. In his speech, Duterte also called Americans “discourteous people” who are too loud for Asian sensibilities. He said he likes China because it does not go around insulting people. Chuckling as he spoke, Duterte said that now he was separate from the United States, he would also be dependent on China for a long time. In Washington, the White House said it has not received any officials requests from Manila to change cooperation between the two countries. Duterte has been criticizing the United States for weeks now and hinting that a breakup with Washington was imminent. But his pledge to cut both military and economic ties was the furthest he has gone. It is not clear how the divorce proposal with the United States will play out at home, where a vast majority of Filipinos have positive views of America and economic and military ties are not insignificant. Nicholas Thomas, a professor at the City University of Hong Kong said the announcement is a big win for Beijing that will give it an opening to consolidate its position in the region. Ties between the Philippines and China hit rock bottom in July when an international court ruled in favor of a case Manila had filed against Beijing and its claims in the South China Sea. In 2012, China seized Scarborough Shoal, a fishing ground that has become a key source of contention between the two countries. The two did not mention the issue in public following meetings on Thursday, but they did reach 13 cooperation agreements, including those for tourism, transportation, infrastructure, and financing. 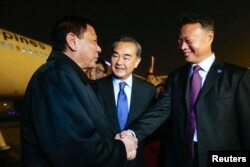 China has also pledged support for Duterte’s controversial and deadly war against drugs that has left more than 2,300 dead. Manila’s Treasury Secretary Ramon Lopez said the two countries will sign $13.5 billion in deals before the visit wraps up on Friday. Duterte came to China with a laundry list of requests, including help with infrastructure and building up of Philippines’ railways, but one key issue, fishing rights did not get addressed. Before traveling to Beijing, Duterte said he would ask Beijing to allow Filipino fishermen to operate in the Scarborough Shoal area. A top Chinese diplomat said the two would resume long-stalled diplomatic and defense talks, the lack of any resolve could disappoint some at home. Liu Zhenmin argued that disputes in the South China Sea were not the sum total of relations between the two sides. In addition to lifting restrictions on the import of fruit, Liu said China would also end a travel advisory that discouraged tourists from traveling to the Philippines. “Everyone can see that the agreements we have signed this time, including cooperation between the two countries' coast guard departments marks the start of the two countries' maritime cooperation," Liu said. On Thursday, Duterte met with China’s Premier Li Keqiang and Chinese leader Xi Jinping. Referring to the two as brothers, President Xi said he hoped the “milestone” visit would “fully improve” ties. "(I) hope (we) can follow the wishes of the people from the standpoint of mutually essential and common interests, and use this visit as an opportunity to push China-Philippines relations back on friendly footing and improve the relationship in all aspects," Xi said. For China, with its tightly controlled media and online censorship, dictating the narrative regarding the wishes of the people may be easier. But for the Philippines, and Duterte, that is likely to be an issue that is harder to manage.